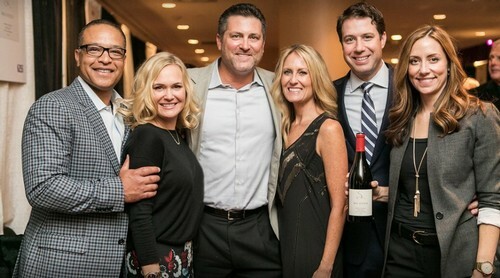 Drawn together through a blind tasting group, our families (the Aurilias, Miceks and Roberts) have become close friends and devoted wine enthusiasts. Beginning in 2007, we have enjoyed incredible tastings in our homes and at our favorite restaurants across California and around the world. As our love for wine brought us closer together, our relationships across Napa and Sonoma grew deeper as well. After the 2008 baseball season ended for Rich and Dave, we started to lay the groundwork for our venture into the wine business. Enjoying one incredible tasting after another across the Napa and Sonoma Valleys, visits with Rolando Herrera of Mi Sueño Winery, and the story of his passion for the art of fine wine, led us to friendship and an ultimate partnership. Rolando's knowledge, relationships and enthusiasm for Red Stitch have given us the opportunity to source incredible grapes from some of the finest vineyards in the Napa Valley. Since the formation of Red Stitch, Rich, Amy, Dave, Tricia, John and Noelle have been intimately involved in the winemaking process, and have worked closely with Rolando and the entire Mi Sueño family to craft a blend of Cabernet Sauvignon and Malbec that would stand the test of time. This hands-on approach defines our group's desire to be involved in all aspects of the winemaking process. The inclusion of the Malbec varietal in our flagship Cabernet Sauvignon is both due to the varietal's outstanding characteristics and the layers that it brings to the wine, as well as the fact that a fantastic Malbec tasting first brought our families together in San Francisco! Since our inaugural 2007 vintage, we are proud to have deepened our relationships with the wine community. In 2011, we were fortunate to partner with the renowned vineyards Soberanes and Sierra Mar in the Santa Lucia Highlands, to craft two outstanding vineyard designate Pinot Noirs and a Chardonnay. These wines have become an integral part of the Red Stitch portfolio, and we could not be more thrilled!